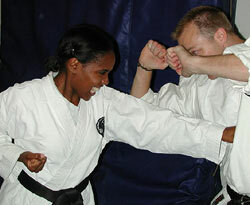 Genevieve began her Martial Arts training in Shotokan Karate at the age of seven. While dabbling in both Tae-Kwon-Do and Shaolin Kung Fu, Genevieve finally settled on Goju-Ryu Karate in 1993 at the Westminster Karate Club in Central London. "I have always believed that as a woman there is no point in taking the easy path - Martial arts are about facing and overcoming adversity"
An article by Genevieve on training whilst pregnant can be found in Traditional Karate Volume 15, No 12, (August 2002). Genevieve achieved Black Belt level in September 1997 and after completing her 30 Man Kumite was awarded the rank of Nidan at Summer Camp 2001.